David Foster Wallace (21.2. 1962.- 22.9. 2008.) je bioamerički romanopisac, esejist i pisac novela, najpoznatiji po romanu Infinite Jest iz 1996. Burn, Stephen. "Generational Succession and a Source for the Title of David Foster Wallace's The Broom of the System." Notes on Contemporary Literature 33.2 (2003), 9-11. Cioffi, Frank Louis. "An Anguish Becomes Thing: Narrative as Performance in David Foster Wallace's Infinite Jest." Narrative 8.2 (2000), 161-181. Goerlandt, Iannis and Luc Herman. "David Foster Wallace." Post-war Literatures in English: A Lexicon of Contemporary Authors 56 (2004), 1-16; A1-2, B1-2. Goerlandt, Iannis. "'Put the book down and slowly walk away': Irony and David Foster Wallace's Infinite Jest." Critique: Studies in Contemporary Fiction 47.3 (2006), 309-328. Goerlandt, Iannis. "'Still steaming as its many arms extended': Pain in David Foster Wallace's Incarnations of Burned Children." Sprachkunst 37.2 (2006), 297-308. Holland, Mary K. "'The Art's Heart's Purpose': Braving the Narcissistic Loop of David Foster Wallace's Infinite Jest." Critique: Studies in Contemporary Fiction 47.3 (2006), 218-242. Jacobs, Timothy. "The Brothers Incandenza: Translating Ideology in Fyodor Dostoevsky’s The Brothers Karamazov and David Foster Wallace’s Infinite Jest." Texas Studies in Literature and Language 49.3 (2007): 265-292. Jacobs, Timothy. "American Touchstone: The Idea of Order in Gerard Manley Hopkins and David Foster Wallace." Comparative Literature Studies 38.3 (2001): 215-231. Jacobs, Timothy. "David Foster Wallace’s The Broom of the System." Ed. Alan Hedblad. Beacham’s Encyclopedia of Popular Fiction. Detroit: Gale Research Press, 2001. 41-50. Jacobs, Timothy. "David Foster Wallace's Infinite Jest." The Explicator 58.3 (2000): 172-175. LeClair, Tom. "The Prodigious Fiction of Richard Powers, William Vollmann, and David Foster Wallace." Critique: Studies in Contemporary Fiction 38.1 (1996), 12-37. Nichols, Catherine. "Dialogizing Postmodern Carnival: David Foster Wallace's Infinite Jest." Critique: Studies in Contemporary Fiction 43.1 (2001), 3-16. Tysdal, Dan. "Inarticulation and the Figure of Enjoyment: Raymond Carver's Minimalism Meets David Foster Wallace's 'A Radically Condensed History of Postindustrial Life.'" Wascana Review of Contemporary Poetry and Short Fiction 38.1 (2003), 66-83. "The Usage Wars." 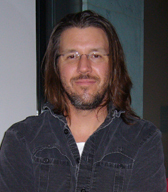 Radio interview with David Foster Wallace and Bryan Garner. The Connection (30 March 2001). ↑ Wallace, David Foster. Interview. The Leonard Lopate Show. WNYC, New York. March 4, 1996. Radio. ↑ "Interviews - Neal Stephenson - Powell's Books". Powells.com. 16. 02. 2011.. http://www.powells.com/authors/nealstephenson.html?utm_source=overview&utm_medium=rss&utm_campaign=rss_overview&utm_content=Neal%20Stephenson&PID=12. pristupljeno 26. 02. 2011..
New York Times "Play Magazine" article on Roger Federer, "Federer as Religious Experience"
The Writer's Almanac highlights Wallace on the February 21, 2007 broadcast. Ova stranica je zadnji put izmijenjena 14:50, 30 juni 2016.